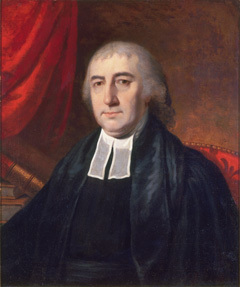 Ashbel Green, valedictorian of the Class of 1783 (the year George Washington and members of the Continental Congress attended the Commencement ceremony) was the second alumnus to serve as president of Princeton. Green was a prominent clergyman, serving as minister of the Presbyterian Church in Philadelphia and chaplain to the United States Congress. As a trustee of the College, he represented the conservative “Old Side” and took a leading role in opposing the liberal drift in the faculty and curriculum. He became president in 1812 after helping engineer the removal of his predecessor. That same year, believing that Princeton was no longer serving the church as it should, he helped establish a theological seminary next door. Ashbel Green (1762–1848), Class of 1783.